One of the biggest problems with my games collection was missing artwork, So I decided to build numerous tools to scrape for missing media. the problem I found was not the fact that the LaunchBox database didn't have the game I was trying to get the artwork for but, the fact that the Title didn't match the Title on the Games Database. So I decided to build a plugin that will allow you to link the games that are missing a database Id. this plugin is not perfect, this will not work for Arcade at the moment. the Id can be reset by selecting unset but will not allow you to do so after clicking DONE. please check that games are matched correctly as the auto matching links the game before displaying the GUI so it is matched even if you don't click done. Auto matching uses regex to strip non letter and number characters from the game title then compares it with the same expression in the games database. it uses string contains which means if you have a game called A or the games Database contains a game called A, it will match it to a game that has the letter A in the title. for example GameTitle is Alien 2, Games Database Name is Aliens these will get matched together or vice versa. after selecting your desired platform to match the plugin will scan all the games in that platform to get all the games missing a LaunchBox Database ID. the plugin will then scan the Metadata.xml and find all the games in that platform that have not been linked to a game in your collection. Great idea for a plugin and it's looking good so far. The one issue i'm having with it at the momemt is that that the listbox is too small so I can't read all of the game titles. Going full screen with the window doesn't make a difference as nothing resizes with it. If you can get that sorted, I can see me using this all the time. Just uploaded an Update, Fixed size and sorted games alphabetically. Platform select screen still seems to be unsorted plus I'm having font issues on the game match screen. added a update to sort platforms. I am not sure what is causing the text issue, can you try adjusting your screen resolution? all the labels are added dynamically so for me it gets a bit confusing setting sizes. Just tried out the new version, and I let a couple of DOS games stay autodetected and set the rest to Unset, just to check things out. Now, the ones that I let be corrected are still set to their previous Wiki entry and the "disassociate " button in LaunchBox doesn't work anymore, so I can't correct them manually. Tried restarting LB too. Seems to have messed up the entry somehow. thank you for this bug report. I had no idea that the wiki entries needed to be removed. give me 2 minutes to fix this. Uploaded a new version, this will prevent the bug from happening in the future. it will also fix the ones from the previous version. simply select the same platform again and it will check for games with both a launchboxid and wikiid. hang on there is actually a better way of handling this. done. when clicking done it will check for games with both launchboxids and wikiids. doing it this way will prevent auto matched games from removing the wiki link if they are unset. Cool. Thanks. I'll try it out. Yep, that fixed the ones that were messed up and new ones work too. I do have a request though. Can you please make an Unset All button so you don't have to go through and unset each individual game? I have tons of incorrect matches because the games don't exist in the database yet. I'm going to use your plugin not only to find matches, but also to find the games that aren't in the database yet and enter them, it'll be an invaluable tool for that too. Thanks for all the great and fast work BTW. added a checkbox for automatch. you will be able to disable the automatching feature. added a log file to show you games in your library vs games in the gamesdatabase. Awesome! I'll check it out ASAP. Awesome job! Thank you SO much! This is extremely useful. Especially the log file! Makes me wish I could make plugins. Only saw one thing that could be better. Can you get the "MS-DOS Games in your library not found on GamesDatabase" list alphabetized? I selected "Tools - Games Database Match". Window appeared. I selected platform, checked "automatch" and pressed "next". Then the box went away, and nothing else happened. Anything I'm missing? Thanks -- excited to try this! Never mind -- the platform had a lot of entries and it took 20-30 minutes for the next window to appear, but it eventually did. I have been doing the manual updates with this tool and it is working great! 1. I can resize the main window, but the content with the scroll bar does not grow to match the window size. Would be nice to be able to resize the window and have the game selection area grow to the window size. 2. The app shows the bios rom files that I have marked hidden. Could the app honor the hide rule and not display the hidden files? 3. This is more of a question. 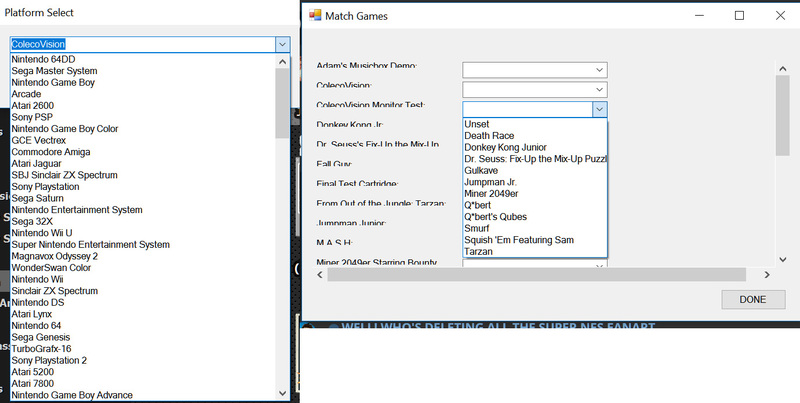 After I have matched some games to the database, does the database matcher update all the missing fields to match what it found besides the database ID? Can it also download the additional images that the database has that might be missing? +1 for the window re-sizeing!